The cell is the basic unit of every living organism and human cells have a complex internal structure in which functions are undertaken by discrete parts. 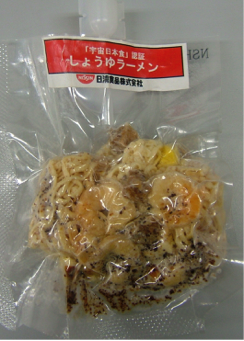 The picture is actually a sealed pack of a meal prepared for astronauts. It is a good way to think of cells since each one is a sealed-sack of components. The major difference is that in the case of the cells usually the bulk of what is inside is water, so maybe think of a cell as a "soup-in-the-bag". 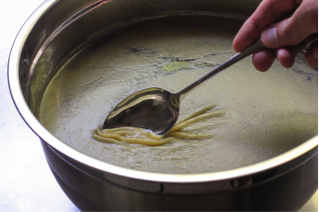 The "soup" is call the cytoplasm or if someone is referring specifically to the water component: the cytosol. ​The sack/or bag of the cell is the plasma membrane. 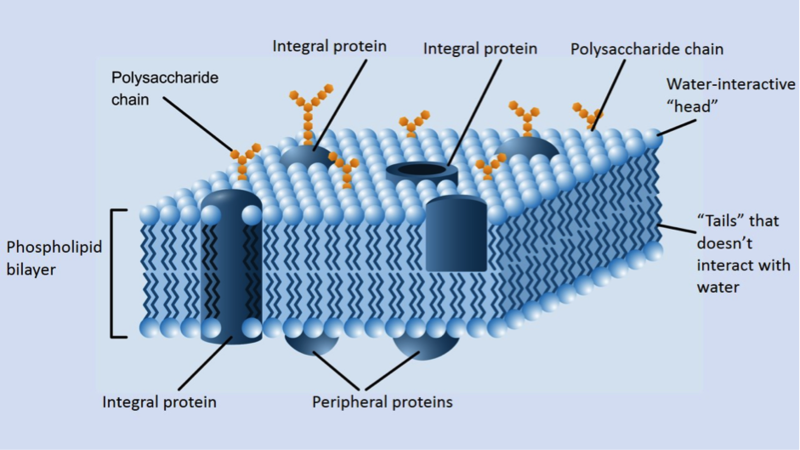 The basic structure of the plasma membrane is shown in the diagram above. To interpret the image, imagine a piece of the plasma membrane of a cell has been cut out and set aside so you can see both what’s on the outside and what’s in the inside. With the exception of bacteria, the internal anatomy of the cells of all other organisms is very complex. ​You can see that in the diagram above. So, sticking with the soup-in-bag analogy of a cell, it’s actually a chunky soup. The chunks are the various individual and specialised functional units of the cell and they are called organelles. Which is a very appropriate name for them since it means “little organs" and these are very small structures which serve as the cell’s “organs”. 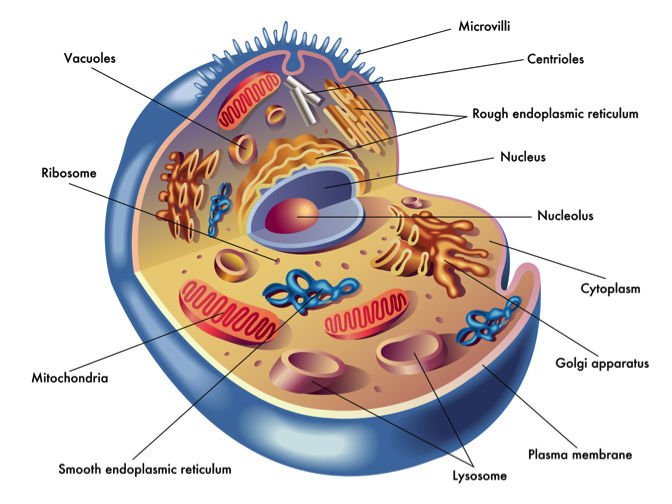 Here is a short description of functions of each of the organelles found in human cells. Centrioles: What the diagram doesn’t show is the internal framework of proteins which give the cell its shape. This is called the cytoskeleton (literally the skeleton of the cell). The centrioles are part of this and are involved in coordination of the processes involved when one cell divides into two. Movement of things in and out cells means crossing the plasma membrane and exactly how this happens will vary between different things. The pictures of congealed fat on the top of chicken stock and a cup of tea using a tea bag are to help you understand about things being transported across the cell membrane. However it is not a complete barrier. Instead it is described as being semi-permeable some things have the right chemical properties to cross the plasma membrane. Small molecules without any electrical charge that can be dissolved in fat will easily cross the plasma membrane as long as there is a concentration gradient. Imagine this is cell and we are looking at the movement of molecules of a single chemical. Clearly the concentration of the chemical is high on the outside of the cell and low on the inside of the cell. This means there is a concentration gradient on either side of the plasma membrane. In simple diffusion, if the molecules can cross the plasma membrane, there will be preferential movement from a region of high concentration to low concentration. Oxygen crosses the plasma membrane by simple diffusion. ,As a nurse you are a facilitator, you will be the means of helping to patient perform tasks. Without you the task may prove too difficult for the patient or take far too long. For molecules that can’t cross the plasma membrane because they are too large and/or have an electrical charge: what’s needed is a facilitator. In this case it is a protein embedded in the plasma membrane which essentially ferries the molecule across. This is facilitated diffusion. The protein responsible for the facilitated diffusion of a particular molecule will be specific for that molecule. So, for glucose to be transported across the plasma membrane there must be specific glucose transport proteins embedded in that plasma membrane. 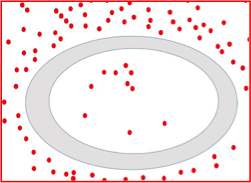 While the amount of movement that occurs with simple diffusion is dependent on the concentration gradient, facilitated diffusion relies BOTH on a concentration gradient AND the number of transport proteins present. This is just like traffic movement across a bridge dependent on how many lanes are available. Water is a small molecule and it also has no charge. So water molecules can move across the plasma membrane. This process is greatly assisted by the presence of specific water-transporting protein channels running through the plasma membrane. Here’s another situation with a concentration gradient. In this case ability of the molecule to cross the plasma membrane is restricted. So to “balance things out” water will cross the plasma membrane instead. Since the outside of the cell is more concentrated than the inside of the cell: the preferential movement of the water will be to outside of the cell. Osmosis is a critical process in the transport of water from the lumen of the gastrointestinal tract (GIT) and ultimately into the GIT blood stream. Osmosis is critical in the process where the kidneys reduce the amount of water lost in urine if someone is dehydrated. For normal cell function, the cytosol must have a high potassium concentration and a low sodium concentration. This is achieved by what is called a solute pump, in this particular case it’s an embedded protein called the Na+K+-ATPase. This pump moves potassium into cells and sodium out of cells even though this is against an existing normal concentration gradient. In order to do this, chemical energy (ATP) must be consumed. In some cases it is the binding of a molecule to a specific protein on the outer surface of the plasma membrane that is a trigger for endocytosis.